One year ago yesterday, I wrote my first blog post on Dig as I started writing the script. Here, one year later, I am literally putting the finishing touches on the film after receiving the final sound mix, score and color corrected footage. Tomorrow, I drop several DVDs in the mail, the film on its way to various film festivals across the country and in about a month Dig will be having its worldwide premiere at the 2011 LAShorts Fest Festival. I can't believe it's been a whole year! It's been a busy last couple of weeks as I balance finishing the film with my daily work at Dare to Pass. As I didn't have the chance to post through I wanted to take this chance to provide a summary of all the post work we've done on the film. So here we go. For the last couple of months of both editing and rough cut screenings, all the way through mix and scoring, I've been looking at a very "eh" picture. This has nothing to do with Paul, he shot it correctly and beautifully, but more to do with the filter settings applied during the shoot, which were more a tool for Paul than a representation of how it was shot. The footage was largely overexposed and just obviously not colored. The desert portion of the film, which takes place in real time over the course of about twenty minutes was shot over three days. There's bound to be shifts in color temperature and so on that needed smoothing out, if nothing else. You have to take a pass on color regardless. For me, however, it was also about creating a very specific look and feel to the film as well as enhancing the colors. From the very beginning, Paul and I devised a color scheme that progressed through the film. Essentially, the opening is white (bright), then blue when we're inside the car, then orange/red/brown when we're in the desert and finally, green, at the end. So, we wanted to enhance those colors (without it looking too stylized) for one. The other part of it was to help it feel period, help it feel like the 1960s, when it takes place. Fortunately, my colorist has been watching a lot of Mad Men and The Kennedy's and had a pretty good sense of what he needed to do to help achieve that look. I've provided some before and after examples of the color below. The color work on this was done by my long time friend and colorist James Cohan who did an amazing job. I met James back in 2007 (a meeting I'm sure he now regrets) when I went to mtvU to do post work on The Ronnie Day Project. 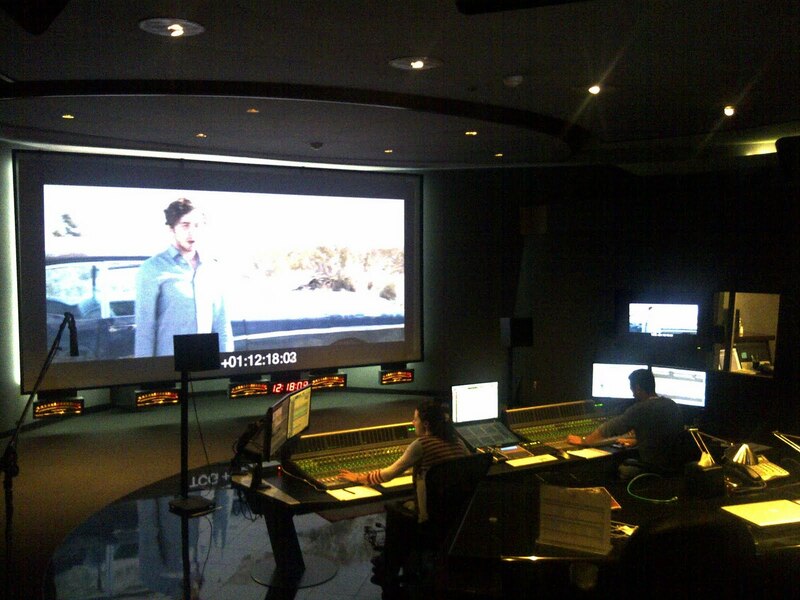 James is the Head of Post-Production for mtvU and now MTV360 and is a editing/coloring/workflow genius. He also doesn't sleep. All of the work was done in Color and as you can see from the images above, Dig looks amazing! Maybe I'm wrong, but I feel that one of the hardest things for young filmmakers and short directors to do is figure out music. In high school it was easy, just use whatever you want. (My film American Tragedy was basically scored using the American Beauty score by Thomas Newman...the similarities in titles was, honestly, entirely coincidental.) Once you're out there, making films that you hope will be shown in festivals, it gets harder. I was extremely fortunate to both meet and work with composer Bill Brown prior to Dig on Anthony E. Zuiker's Dark Prophecy. As I headed up post on that project, Bill and I spent a good chunk of time working together. I'll never forget (and I'm sure he won't either) that after getting the first set of cues on Dark Prophecy I sent him more than three pages of notes. His response on the phone was "I've never really gotten notes like this before..." Here I was, a no name kid, giving a very accomplished composer a significant amount of notes on a small internet based project. I'm sure he was less than thrilled. But then I went into his studio, to explain my thoughts, gave him my ideas and started to not only agree but get excited about them. After that first meeting, it was smooth sailing. He saw that I wasn't trying to do his job, or tell him what to do, but to marry the beautiful work he had done to the film in the most impactful way possible. After all, I had spent months with the picture, knew it backwards and forwards and thus felt I could offer him that perspective. 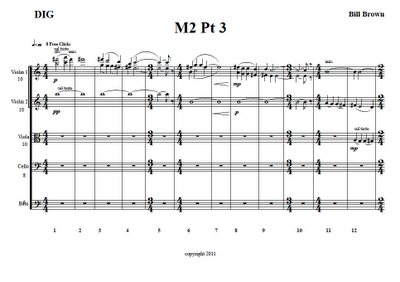 Regardless of all of this, it worked out, and he created a really moving and beautiful score for Dark Prophecy. 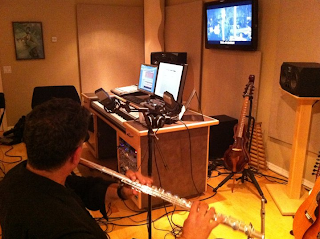 It was during this process, as I was writing Dig, that I knew I wanted to ask Bill to do the score for Dig. There was no one else in my head. 1) I knew that he could deliver what I wanted and 2) I really wanted to work with him again. Fortunately, after viewing a rough cut of the film, he said yes and went on to fulfill my expectations in every way. We also, much thanks to Bill, were able to record the ending music with a live orchestra, something we had also done on Dark Prophecy. I had never heard the real difference between synth and live instruments before, much less on the same piece, but let me tell you, it is a remarkable difference. The main addition being emotion. You feel the players on their instruments. And you have so much more control over the sound. We also, on the opening track, had some really great musicians come be a part of it. 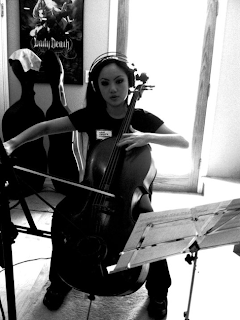 The amazing cellist Tina Guo provided the cello solo on the opening. Also, Steve Tavaglione, a woodwind musician whose playing you might recognize from Shawshank Redemption, The Road to Perdition, American Beauty came on board to provide some really great sounds for the finale. Steve is a frequent collaborator of Bill's and he brought him on board for Dig. And here are some pictures of Bill's sessions with Tina and Steve. I had never mixed on a stage before and man does it make a difference. 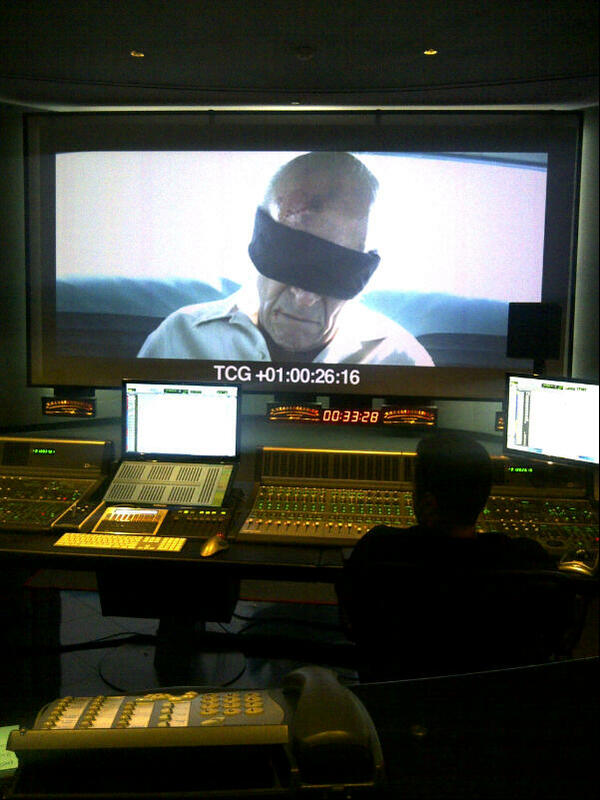 When I handed off the film to Aaron Levy and Alexandra Fehrman the sound was a mess. Five separate tracks of audio (in some cases) comprised of both boom and lavs, big gaps in sound where I had cut dialogue and had no "room tone" (or desert tone) and a big section in the middle of the film (the desert part) where I knew I wouldn't have music. I wanted to fill it with something, I wanted to create a soundtrack to the desert. When I came back two months later to check out the edit, Aaron and Alex had done their work. The dialogue sounded great, the desert was alive, everything was smoothed out, Alex had some subtle but amazing sound design to help enhance key moments in the sequence (without it become too dramatic and maintaining a natural feel to it). It was great. I had very few notes. Two days later, we were the mix, where Aaron and Alex sweetened and leveled Dig to the best place it could be. In addition to the standard stereo mix we also mastered in 5.1 surround sound. As you can see from the pics, we're talking about a full on stage here. And in that million dollar theatre it sounded amazing! (It sounded great on my home theatre system too.) One of the things I said to them when we started was I want this to be mixed for the theatre experience. This film is made to be watched in the cinema, not on the computer. So that was where I focus was and everyone did a really great job. I have been incredibly fortunate to have an amazing group of professionals work on my little short film Dig, many of whom have no reason to work on a very low-paying (or unpaid) short project. Their only reason is that 1) they like working with me 2) liked the project or 3) both. Either one means a lot to me, that they would take time out of their schedules and lives to help me see this project through on a level that I could only imagine when I started writing it twelve months ago. I am truly honored to have the list of credits I do at the end of my film and it has been a dream to work with this cast and crew. I can't wait for you to see the film so check back often for potential festival screenings. I hope you've enjoyed this year long journey of putting Dig together as much as I have but the creative work has ended. So now it's onward and upward to newer projects as I release Dig to the world.